A variety of hane involving another enemy stone ready to cut immediately. This move is usually played for some special tactical advantage. Purely for strategical reasons this move is bad because it gives the opponent an ideal cut. 'a' instead of 1 is the "strategically correct" hane in this shape. is hanedashi. is the stone ready to cut. White is almost certain to cut. Black will probably play one of the lettered moves. 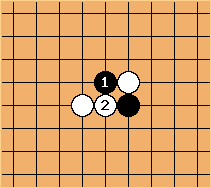 4-5 point 4-3 approach keima, contact at 3-5, hanedashi. Hanedashi is a Japanese go term in common use in the West. The alternative expression hane inside is less widely used. John F. Hane "through" (or through-hane) may capture the meaning of -dashi better and avoid confusion with hanekomi.